Hi all, Yesterday I received some new goodies from Simon Says Stamp. In the package was We r Memory Keepers Next Level embossing folder. I have been waiting to get this for a long long time. I just love the dimension the Next Level folder gives. So beautiful. This one I have used is called Wave. There are two folders in this set. To make the dimension stand out, I wanted a pearly background. The light reflected off the sheen gives shadows and highlights making the dimension look detailed and wonderful. Here is the card first. In my pack of new goodies, I also bought some Ranger Liquid Pearls. Virginia Lu’s Christmas card she sent me had these beautiful liquid pearls embellishments. So I bought a few colours. Instead of using as pearls, I decided to cover my entire background using them. I chose a teal and bright green called Juniper and Key Lime. I brushed them on a white cardstock using a broad brush keeping the strokes long and even. I left it to dry. Didn’t take very long to dry as my day is another 40C day. I then ran this panel on the cuttlebug using the largest stitched rectangle die from Stitched Rectangle Die set from Simon Says Stamp. Then again ran this panel through the cuttlebug using the Wave Next Level embossing folder. WOW! the panel is so beautiful as you can see. You can see the shadows and highlights on the dimension because of the sheen texture and colour on the panel. 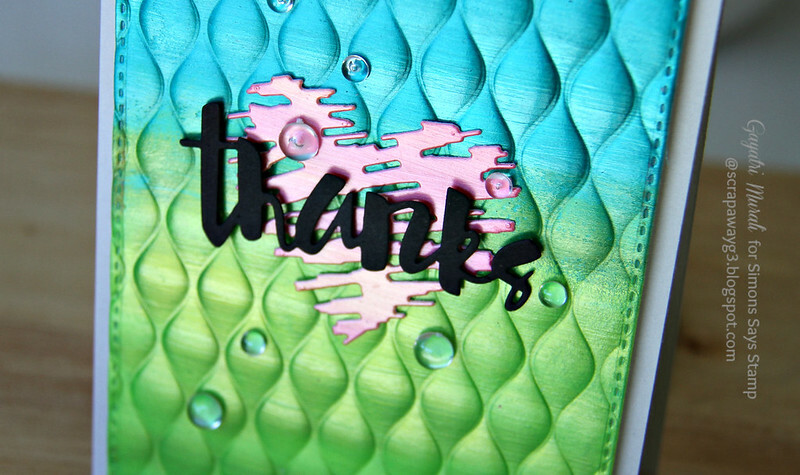 For the focal point, I did exactly the same process using Cantaloupe and Flamingo liquid pearl and die cut using Scribble Hearts die from Simon Says Stamp. 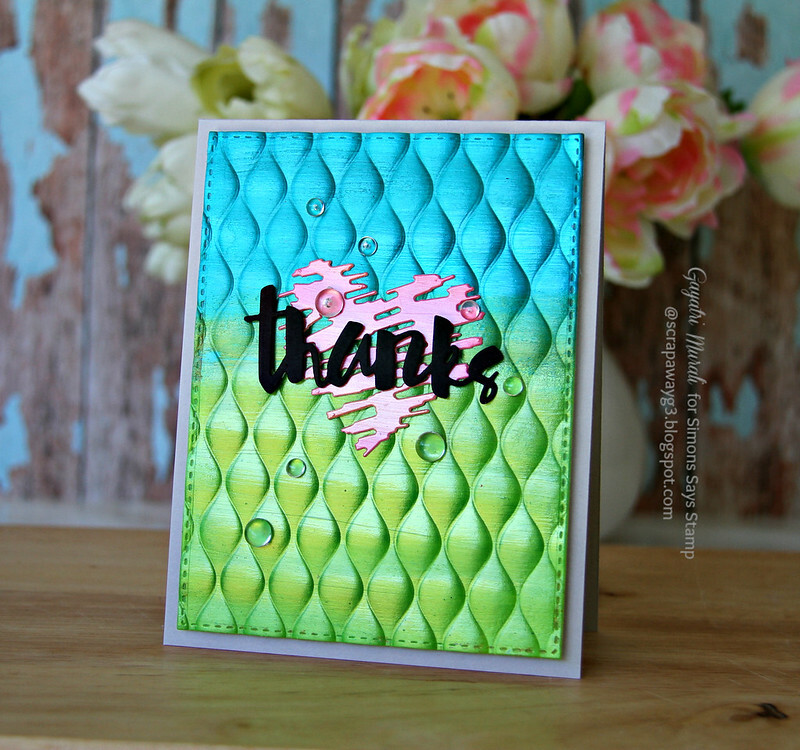 Love the sheen using the liquid pearls. I layered this on the panel. Sentiment is Painted Thanks die from Simon Says Stamp which I die cut using black cardstock. Finally embellished with Clear Droplets from Pretty Pink Posh. This panel is mounted on Fog card base. Wondered how you got that “sheen”! Have never heard of Liquid Pearls. I was wondering how you colored the panel!! I've never heard of using liquid pearls for coloring! So beautiful!! And the colors you have chosen are gorgeous! was hesitant about ordering the new wave folders as they are 6×6, and not sure if they would fit in the opening of my cuttlebug which is exactly 6 inches..but now that i know they will fit, and having seen your inspiring, will have order some (and liquid pearls too). This is just stunning! I saw on SCS gallery and HAD TO STOP to see the details. It looks like quilted silk. WOW is right. It is stunning. The colours are so intense and the embossing is amazing. I really like the WRMK Next level. I have a few of the earlier ones and they really add something to a background. Gorgeous! I never thought to brush Liquid Pearls on like you did–what stunning results!